It’s late March and the weather hasn’t been very conducive to bringing out the spring bonnet, so I spent one Sunday sorting out some closets. One of the things that I had to move was my sewing box. On top of that box sat an old friend… my grandmother’s button box, in an old fruitcake tin. Over the years the box has changed from being worn out from use, and the contents have grown somewhat. Some of the buttons are still on their original cards when they were purchased years ago, but many are recycled from past articles of clothing. My fondest memory of this box is it being given to me, to look at as a very small child, one cold winter day when Mom had errands and she left me with Gram. In those days the old farmhouse kitchen was heated with a wood stove, which has a wonderful spot just big enough for my little chair behind the stove. I would sit for hours looking at all the wonderful colored buttons in that box, many of them being handed down from my great-grandmother. My grandmother could tell which garment most of the buttons were from. We had many discussions about the clothing and the person who wore that particular fashion with what button. Most of the time there were wonderful stories of balls and special dances. My family may have been from the country but they were quite the social butterflies, at times attending many functions in and around Franklin County. I can remember watching my grandmother sitting at the sewing machine, creating beautiful dresses and outfits for my mother, her sister and myself. Gram was an accomplished seamstress, and had even taken a tailoring course in Boston at some point in her busy life. We never lacked play clothes, day dresses and evening wear when the occasion called for it. The button box was never very far away, and sometimes I had the dubious honor of picking those special buttons. When Gram’s household was broken up, the button box was one of the things that I requested for myself. I’ve kept it all these years, using the buttons for my daughters when they were growing up. I don’t sew much these days, so the box has been kept in the closet. I suppose button collectors would have a hay day with the buttons in the box, many of them dating to the early 1900s, but I find the memories too great, and I hope to pass the box on to one of my daughters or possibly a granddaughter. Not many people take the time to remove buttons from an old shirt or dresses theses days, but I can tell you, they are missing out on memories of their own. The Locomobile automobile (1900-1929) finds its evolution linked to the indomitable and identical Stanley twins, F.E. and F.O. In 1896, after re-locating their successful photographic dry plate business to Watertown, Ma., from Kingfield, Me., the Stanleys started experimenting with a steam propulsion automobile and by 1899, were building cars for the public. In the same year, the Editor and Publisher of Cosmopolitan Magazine, John Walker, was also I interested in getting into the burgeoning automobile business, and approached the Stanley brothers with an offer to purchase their company. After repeated offers and their constant refusal to sell, the Stanleys were quickly tiring of the annoying Mr. Walker. In an attempt to get rid of him, they countered with an exorbitant price of $250,000 ( $7.1 million today) and a term of 10 days. 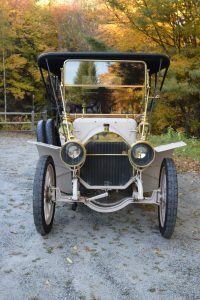 To their surprise, Walker jumped at it, and along with Amzi Barber, ”the asphalt king”, purchased the company from the Stanleys and changed its name to Locomobile. With only a one-year “non-compete clause” in the sales agreement, the wiley Stanleys were right back in business. Within the year, Walker and Barber split, after Barber discovered that he had been hoodwinked into paying the full $250,000, and Walker had invested nothing. Barber ended up owning Locomobile outright, and moved it to Bridgeport, Ct. Walker went on to build the Mobile steam car in Tarrytown, NY., but by 1903, he was finished. 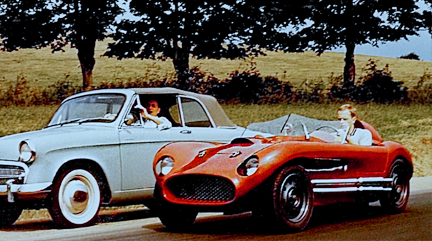 Barber desperately needed someone who knew more about automobiles than he did, so he hired an electrician/mechanic by the name of Andrew Ricker, who then traveled to Europe to “observe” automobile designs, specifically Mercedes. Locomobile continued with both steam and gasoline engines until 1905, when they switched to gas engines exclusively, fighting several Mercedes patent infringements along the way due to Ricker’s keen sense of “observation”. The “Type E” was designed for this year and continued through 1908, with many mechanical improvements. It utilized a 15/20 HP “T Head” four cylinder engine, dual chain drive rear axles, and a 3 speed sliding gear transmission, which evolved into a four speed selective gear transmission in 1908. Ignition was a “make and break” type running off the intake camshaft, with the hammer and anvil spark inside the combustion chamber. Spark timing was adjusted by sliding the cam back and forth. (Google “make and break engine” and watch Greg Cone demonstrate his 1908 Matheson’s “make and brake” engine). Locomobile’s slogan was “Easily The Best Built Car In America”. They were indeed, exceptionally well built and expensive, utilizing bronze castings for the crankcase, transmission case, steering box, etc. Although only a 15/20 HP engine, the “T Head” accelerates to a very comfortable cruising speed of 45 MPH, as was evidenced on my recent Fall day outing. The story behind Fred and BJ’s Locomobile is filled with all sorts of characters. Soon after WWII, a widow from Wycliffe, NJ. contacted Henry Austin Clark, who owned the Long Island Automobile Museum, and wanted to get rid of her late husband’s 1908 Locomobile. She would be willing to part with it for $1, just to make the transaction legal. This was common at the time and many cars were acquired this way after the war. The famous opera singer and collector, James Melton had many people give him early cars. Remember, these vehicles were only 40 years old at the time and pretty well “used and abused”. Apparently Clark took the car and in ’52 sold it to Lou Schaffer, also of Glen Cove, Long Island. 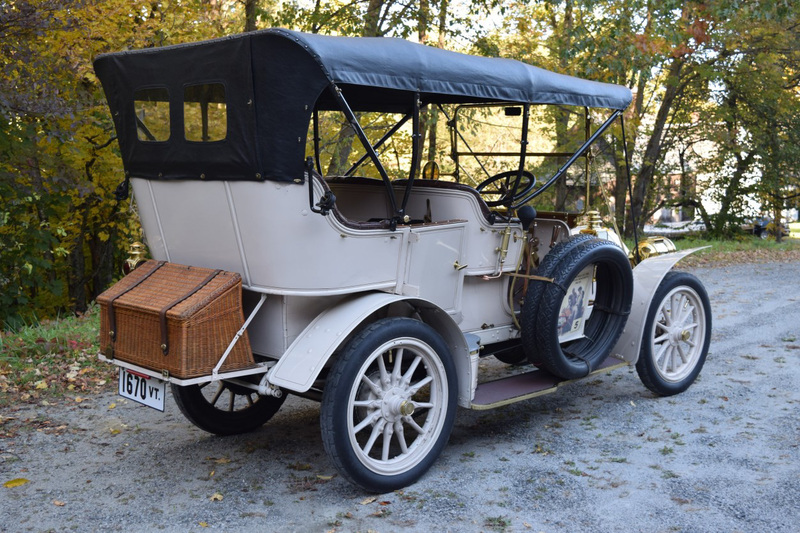 Schaffer spent the next 2 years “restoring” the Locomobile. 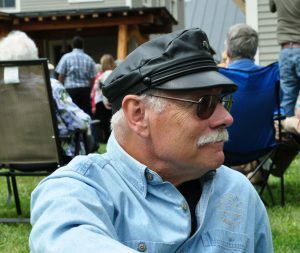 Having only 1905 literature, he made fenders and acquired items that fit the earlier style. In the early ‘50’s, restorations would often copy the oldest styles trying to make them as “antique” as possible. Schaffer finished the restoration in time to participate in the 1954 Glidden tour. Ironically, Fred Gonet grew up only 3 miles from the Locomobile he would eventually own 30 years later. In 1956 it was sold to a John Snyder, who in turn sold it to his son in Scarsdale, NY. Enter, the infamous character Morris Burrows who had a summer house in Springfield, Vt. Morris was a brilliant, yet quite eccentric mechanical engineer. 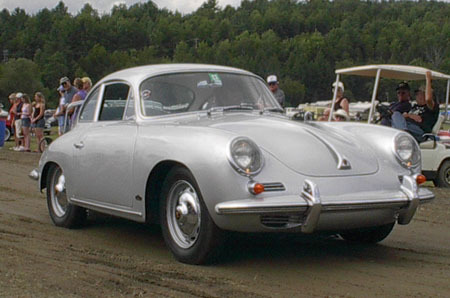 He was known to have bought a new Porsche 911 when they were first introduced in 1963, ordering an extra engine with it so he could dismantle it to study how it was constructed. 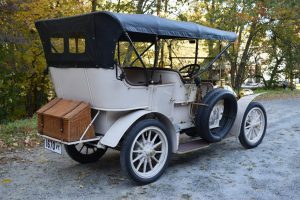 Being a subscriber to Car and Driver, in 1963 he came across an ad for a 1908 Locomobile. For some time he had decided he would like a brass era automobile and decided that Locomobile was a car worthy of him. He paid the lofty sum of $1200, and the Locomobile moved to Vt. Morris and his wife drove the car many miles over the next several years. In 1970, his wife passed away, and he re-married, but his new bride was afraid to ride in the car because it lacked front doors, so the Locomobile was put up on blocks in the basement. 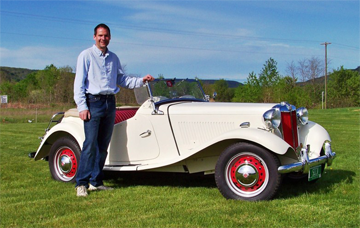 During this time, Fred Gonet had moved to Vt. and became involved with antique automobiles and motorcycles, eventually starting what is today known as G & G Restorations of Proctorsville, Vt., with his cousin John. As time went on, Fred let it be known that he would like to find a brass era car. 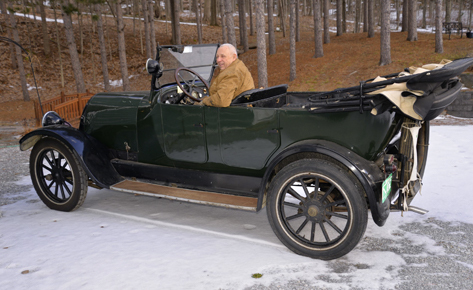 Every year, Harry Olney (Gary’s father) would register and insure his 1910 Reo for Fred to drive around during the summer, but he wasn’t interested in selling. 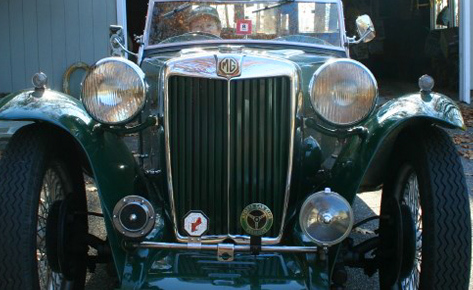 Along comes Ruffus Estey, an old car guy who is a friend of both Morris Burrows and Fred. Morris is now in his 80’s and ill, and Ruffus informs him that he knows of a very knowledgeable young enthusiast that would be a good candidate for the Locomobile. Morris is kind of an irascible old fellow who was known to scold people if they ventured too close to one of his antiques, didn’t especially like children, and could otherwise be a grumpy old curmudgeon( like many of us). Morris agrees to let Ruffus introduce Fred. Being a quick study and fearing the worst, Fred does his homework on Locomobiles. After the introduction, Morris starts grilling Fred, asking him about his feelings on certain engineering aspects regarding the Type E Locomobile, what his plans for the car would be, what he thought about the incorrect 1905 style fenders and the other incorrectly dated items on the car, etc. After a few hours, the meeting ended. Several days later, another meeting, and more questions for Fred. This goes on a few more times, and now Morris wants to meet BJ, Fred’s wife. The meeting goes well, and Morris actually asks BJ if she would like to sit in the car (still up on blocks). 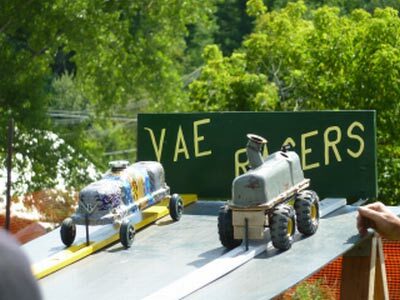 BJ looks at Fred, he shrugs, and so up she climbs into the Locomobile. Morris is concerned that she might feel uncomfortable about the lack of front doors, but BJ is unfazed. As the meeting draws to a close, Morris states he would like to meet their 2 children. Knowing of his unwavering love of children, Fred and BJ agreed, and hoped for the best. Well, as it turned out Morris liked the kids, invited them to also sit in the car and the rest is history. 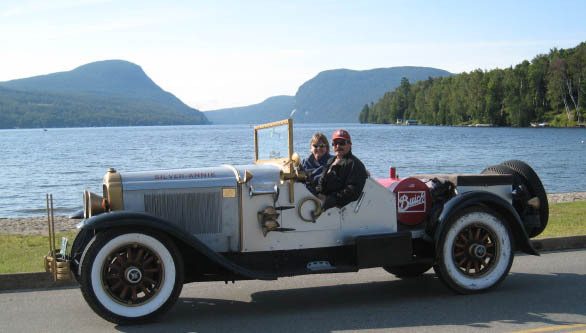 Fred and BJ finally signed the adoption papers in 1985, and enjoyed driving the Locomobile for the next year. At the end of 1986, Fred started a total frame up restoration. Using cardboard templates, he was able to recreate the correct compound curves on both the front and rear fenders before hammering out new ones. Finding an original 1908 owner’s manual (with Morris) at the Bennington car show, Fred was able to fabricate all the other correct pieces for 1908 that he needed for the restoration. 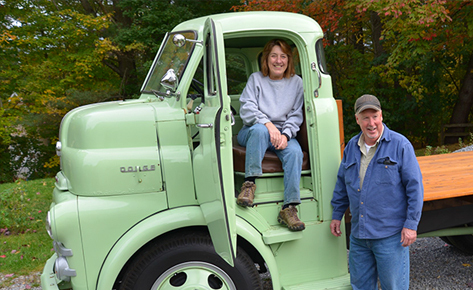 Through good luck and perseverance, he was able to find the original box of discarded “make and break” items that had been taken off the engine in 1952 and eventually sold to Walter McCarthy. If you look on page 893 of The Standard Catalog Of American Cars, you will see a picture of Fred’s 1908 Locomobile taken by Henry Austin Clark shortly after its “restoration” in 1952. Notice the 1905 style ”chopped off” fenders. There are only 7 surviving examples of the Type E Locomobiles, and only this one for 1908. 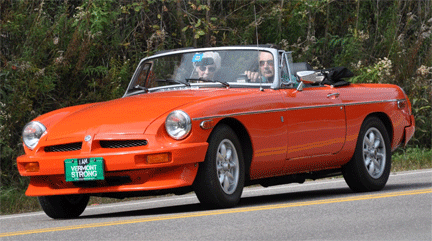 To date, Fred, BJ and family have driven over 40k miles throughout New England and Canada, a true testament to Fred’s meticulous restoration of an exceptional automobile.